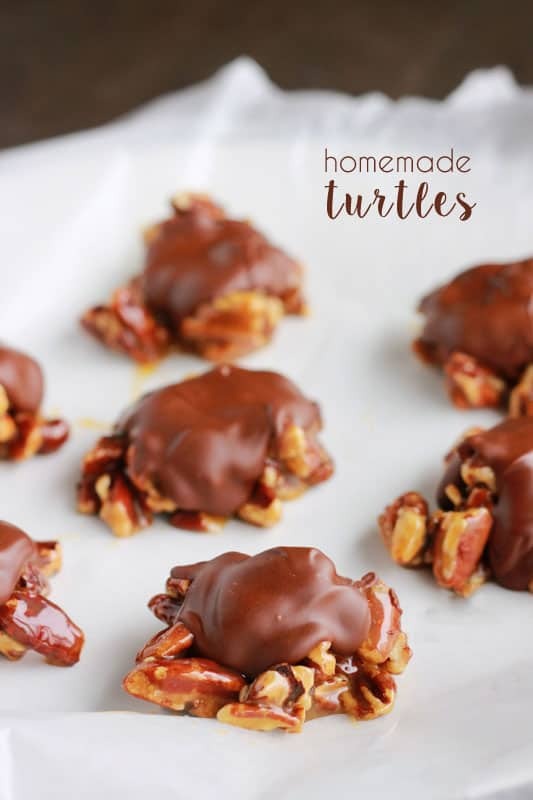 Homemade Turtles Candy. With just four simple ingredients you can have an elegant homemade candy ready for giving! Lightly toast pecans, drizzle with caramel, and top with melted chocolate. 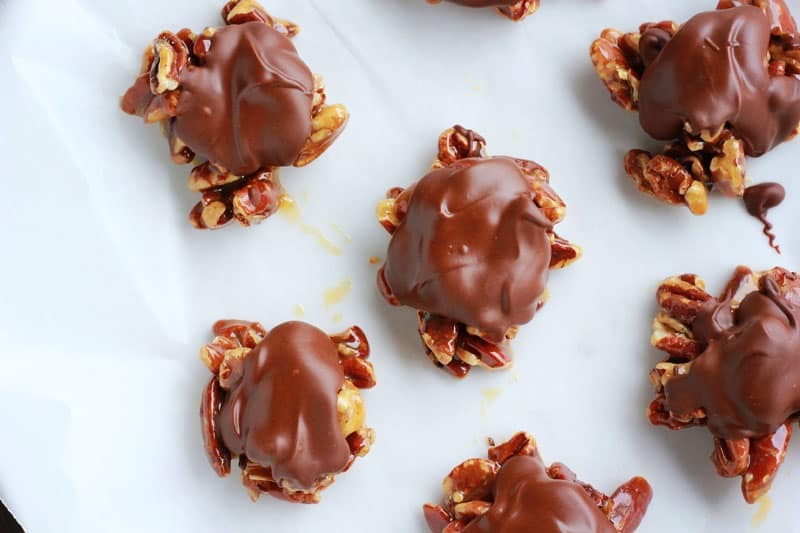 This decadent homemade candy recipe is perfect for giving. Did you grandma have a “secret” candy stash? Mine always had a bowl of goodies on the coffee table… You know the ones? The generic, hard as rock, candies? The real winners were always stashed next to her reading lamp. I loved digging through the little goldmine. You could find everything but my favorite? OK, so they were not homemade. But mine are. Like this recipe? You will love my Muddy Buddies, Salted Caramels, Microwave Caramel Corn! What I love about this recipe is that it is simple. Most of my recipes are super easy to make and use minimal ingredients AND pack a big punch in the flavor department. These are no exception. Disclaimer: These are messy to make. We used a thicker ice cream topping. Make sure that you are picky when you are cruising the aisle deciding on your flavor. The thinner syrups will not work well. PRO TIP: Do not skip toasting the nuts. Toasting is easy. Line a baking sheet with parchment, spread your pecans in a single layer, and bake at 350 degrees for around 8 minutes or until fragrant. Those babies are going to be your base. You will create a small cluster or group on wax paper, top with our caramel, and seal that all in with your chocolate! Line a small tin or box with wax paper and pack these cuties in for a quick homemade treat this holiday season. Stir together the pecans with the ice cream topping. Drop by heaping tablespoon onto wax paper. Refrigerate until solid. Melt together the chocolate chips and shortening in the microwave, stirring every 20 seconds. Spoon over your pecan clusters.